i. OK, So Now Everyone Knows About The GOP War Against Women-- What About The GOP War Against Education? 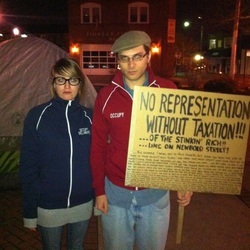 2.NO REPRESENTATION-WITHOUT TAXATION " "
3. Perjury count dismissed against Jim Matthews " "
5.The Pentagon is preparing an array of military options for striking Iran if hard-hitting diplomatic and economic sanctions fail to persuade Tehran to drop its nuclear ambitions, Defense Secretary Leon Panetta told National Journal in an interview on Thursday. 6.Activists Are Reclaiming Vacant Lots For Gardens - But Will There Be Legal Challenges? 7.PURPLE SQUIRREL What the frack is going on? The Occupy movement – at least a satellite group of it – has landed in Jenkintown. A small contingent has camped out since Wednesday night across the street from Congresswoman Allyson Schwartz’s office on West Avenue. The proximity to the congresswoman’s office is no coincidence; in fact, they call themselves Occupy 13th C.D. (Schwartz’s congressional district), although ex-Marine Mike Mizner, the apparent Occupier-in-Chief (to be fair, he’s not a big fan of hierarchies or titles) says they’re real-deal occupiers and not associated with the Nate Kleinman congressional campaign seeking to unseat Schwartz in the Democratic primary. Kleinman, though, has visited and encouraged them on his facebook page. Mizner, a veteran of a four-year stint with the Marines, most recently stationed in Willow Grove, is also a veteran of Occupy Delaware in Wilmington and Occupy Philly. Boot camp, he admits, came in handy while he was doing a two-month Occupy protest starting in early November in Wilmington, spending most nights in a tent or just out in the elements. What was the point? They saved some people’s homes, he said, with obvious pride. Regular protests eventually put a halt to sheriffs’ sales for back-taxes of residences of folks in Wilmington victimized by predatory lenders. The goal now is to engage people from across the 13th Congressional District, including those from Occupy Norristown, some of whom showed up to the first General Assembly in Jenkintown Wednesday night, along with Abingtonians and others from nearby totaling about 30 participants. Those they’ve been building community with include Jenkintown Police Chief Albert DiValentino and Mayor Ed Foley. The chief helped them make sure they don’t run afoul of the law by blocking pedestrian access, and the mayor was “very supportive,” said Mizner. Mayor Ed Foley told Citizens’ Call , “We’re happy to have the group here as long it remains as orderly and respectful of the Jenkintown community as they have been so far.” Foley admitted to being torn by his allegiances since he is a supporter of the Occupy movement at the same time that he is an admirer of Schwartz and would prefer that the protesters move away from the Schwartz office to the nearby town square. The mayor readily conceded “it’s been been an interesting experience having them there” and even that their presence is valued. “In Jenkintown,” he explained, “we’ve struggled with traffic calming and they’ve had an excellent traffic calming effect. No one is rolling through that stop sign anymore . . . It’s really educating people.” Foley and his 11-year-old son stopped by Thursday evening and he reported that they had a memorable conversation with the protesters and that his son learned a lot. “It’s been a good home town example of freedom of speech. In Jenkintown, obviously we don’t get a ton of protesters, but when we do it’s nice when they’re courteous and happy to engage people,” said Foley. But would the occupiers eventually have to move or be arrested for being some kind of public nuisance in the business district? Will they be allowed to keep sleeping in their tents on the sidewalk? Foley double-checked with the police chief and reported back that there’s no law in Jenkintown against sleeping on the sidewalk, although it might be another matter if they were camped in a vacant lot. Asked about the occupiers’ concern about the corrosive impact of big money on the democratic process, she said that the congresswoman has been an outspoken critic of the Supreme Court’s Citizens United decision, which opened the spigot for the flow of unlimited corporate dollars into election campaigns. She said that their campaign is operating within the bounds of the law on campaign financing. She also noted that Schwartz supports public financing of campaigns and is a co-sponsor of the Disclose Act, which would require that the major sources of funds be disclosed in ads financed by corporations and unions and that shareholders and union members would have a right to know the specifics of their organizations’ funding of political campaigns. _ _ _of The Stinking Rich!! NORRISTOWN, Pa. (AP) - A former Montgomery County Commissioner is headed to trial on a misdemeanor charge of making a false statement during a corruption probe. Jim Matthews, the brother of MSNBC commentator Chris Matthews, also faced a more serious perjury charge. The judge in the case dismissed the perjury charge at Matthews' preliminary hearing Friday. Jim Matthews will now go to trial on the lesser charge of false swearing. The case developed from an 18-month grand jury investigation into political corruption. Matthews was not charged in the corruption probe. He was charged because the grand jury believed he lied under oath about a relationship he had with a company that did business with the county. His attorney said the charges are unfounded.